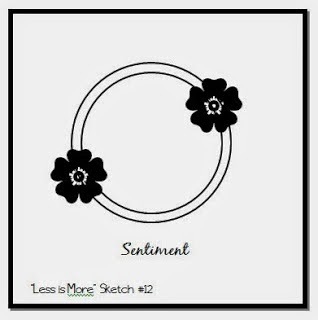 Today, I am playing with the sketch from the Less Is More challenge. I thought of a lot of options but ended up cutting a ring of Patterned Paper from Webster's Pages Parkdrive using Nesties circle dies. I attached this to a square card base of White cardstock. I seldom make square cards because of extra postage needed to mail but ....but it needed to be square for my design. I stamped 2 Azaleas on coral cardstock with Memento Tuxedo Black ink and then colored leaves and flowers with pencils and used glaze pen to add highlights to flowers. 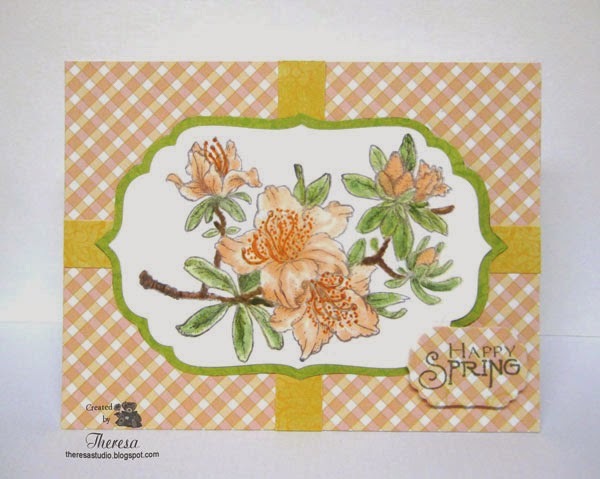 I fussy cut the Azaleas, attached to the card, and stamped sentiment with Memento Pear Tart ink. 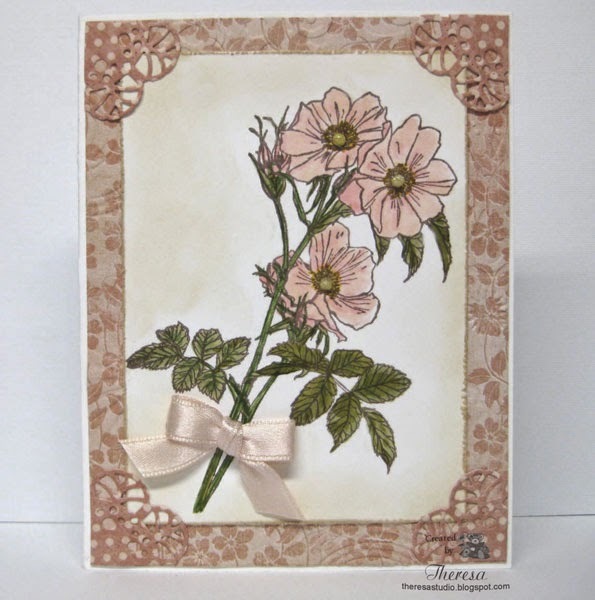 The Azalea Stamp set that I used is from a new company Power Poppy created by Marcella Hawley. Simon Wednesday Challenge: Keep it clean and simple. No Copics used in the making of this card. 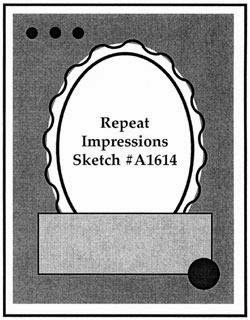 My card today is for the sketch challenge at The House That Stamps Built using stamps from Repeat Impressions. 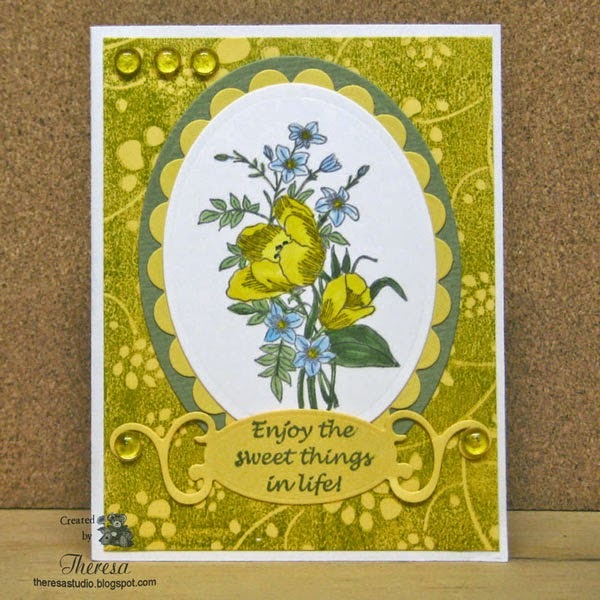 I made the background by stamping Hero Arts Floating Flowers background stamp with Distress Ink Crushed Olive on a yellow cardstock which gave a mottled look. Thanks to Shirley R. for this stamp...it was part of a great blog candy that I received from her last week. I stamped the Tulip Bouquet on white with Memento Espresso Truffle ink and colored with Copics Y02,06,18,YG63,G99, B00,21. Added some touches with glaze pens to flower centers. Layered the image on to Yellow Scallop Oval and Green Oval, both cut with Nesties Dies, the stamped background and finally a White Card Base. Completed the card with sentiment stamped with Memento Olive Green ink on to label cut with Spellbinders Fancy Labels die. Added yellow dew drops to finish. Like the look of this card. Welcome to more talk about scraps. 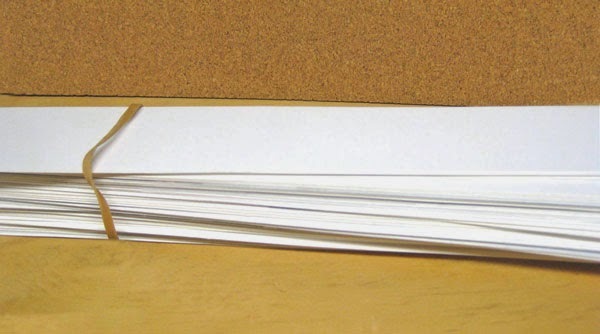 I have accumulated so many strips of white cardstock....so many that I will never use. Any suggestions how to use??? 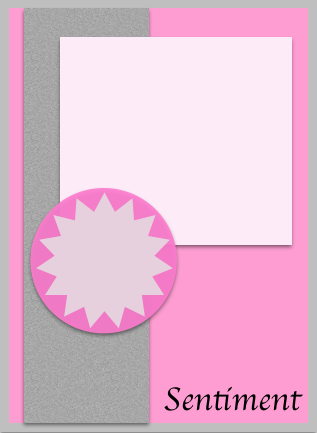 I thought the Ruffle style card would be great to use some of the white strips with a border punch but with a border stamp also. I punched the strips with Fiskars scallop border punch and cut 4" wide. I stamped each strip with the butterfly border from GKD A Year of Borders by Melanie with Memento Tuxedo Black ink and quickly colored with Copics Y 06,11, YR02,07. I layered underneath the punched areas with black scraps before assembling card on Black Card base. I used pop up dots and double sided tape to attach the ruffles . The sentiment at top of card is from GKD Take Flight stamped in the Tuxedo Black ink. Orange Satin Ribbon and bow finished the card with the addition of the cut out butterfly from my box of leftover images. Not sure what stamp I used for that butterfly on the ribbon but it was colored with glitter pens. Stamp TV Release Party Challenge: Winging It - Make a card with anything that has wings- birds, butterflies, dragonflies, etc. There are a lot of wings on my card! I still have white scraps left for other projects. Hello! I used a different style for me on this card made for the challenge at Joan's Touch-to use something from nature, purple and white, distressed edges, and a product from Joan's Garden. 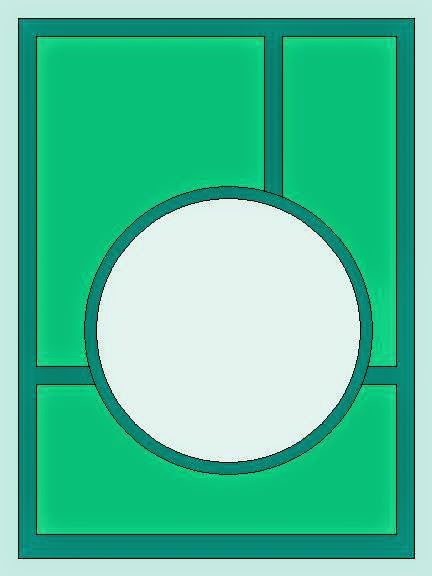 I used a mask made by cutting out a circle with a Nesties circle die. Laying the mask on white cardstock I stamped branches with blossoms using Flourishes Cherry Blossoms with Memento Sweet Plum ink. I then sponged edges of circle with Distress Ink China Blue. I cut a butterfly from purple cardstock and white liner with Cheery Lynn small #2 Butterfly and Angel Wing dies. Added some doodling to the wings. Assembled the card with White card base, Purple mat, Purple Grosgrain ribbon and bow, and the image with butterfly. I distressed the edges of the top layer with distress tool. Cheery Lynn Dies and Memento inks are sold at Joan's Gardens. I will add a sentiment when I use card. Welcome to my studio! Again I am using some stash items and older stamps that I love. I stamped the rose twice and leaves using GKD A Year of Flowers and Pressed Flowers with Memento Rose Bud, Angel Pink, and Olive Green inks. I fussy cut one of the roses and added with pop up dots on the other rose trimmed to a rectangle and edged with Rose Bud ink. Used green and pink pencils to finish coloring. I added gold to the petals with Atyou Spica pen. On the card base of GKD Innocent Pink, I added a strip of Gingham Cardstock ( from scraps) embossed with CB EF Polka Dots. The cut out butterfly was leftover from an earlier project...just added some pink to the gold embossing and placed on a scallop circle with gold edge before adding. I stamped the sentiment from GKD Stippled Nature with Versamark and heat embossed with Ranger Gold EP. 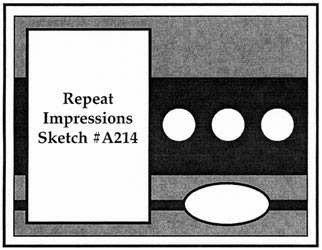 The card was assembled using the sketch from STV shown below. Mod Squad Challenge: Use gingham. Stamp TV Mix It Up Monday challenge: Make a Birthday Card, use the Sketch provided and make PINK the most prominent color. 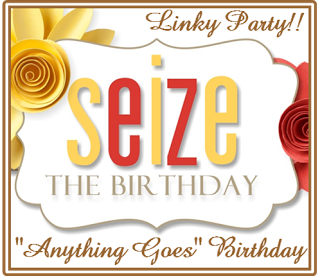 Seize the Birthday: Challenge is Anything Goes. Hello! Hoping your day is going well. Today I have a card made with a digi from Doodle Pantry Petite Bouquet for the challenge at Digi Sketch to use flowers and/or the sketch.. I used the colored image and cut with a Nesties circle die and matted on a SU Brilliant Blue circle. 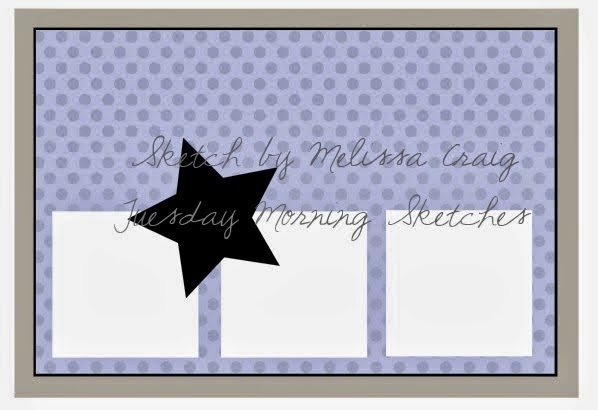 Using the blue as my card base, I added pattern paper from GCD Studios Special Delivery pad and attached the image. I added glaze to the flowers to add some texture. 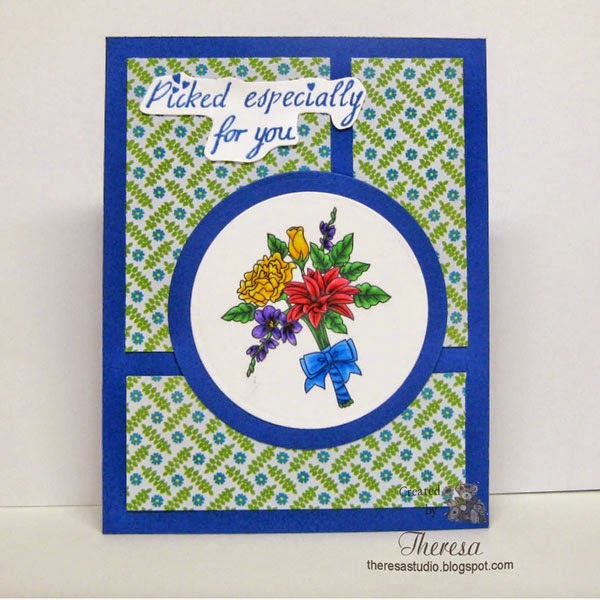 The sentiment stamped in Memento Danube Blue ink is from Joanna Sheen Favorite Flowers and fussy cut. Digi Sketch Challenge: Go with the sketch below, floral theme or both. I did both. Simon Says Challenge: Keep it clean and simple. As I mentioned yesterday, I am trying to use some of the many scraps and supplies that I have accumulated in my studio. Yesterday I saw a tutorial on Operation Write Home about making a Dimensional Ruffle card and thought this would use a lot of those pattern paper scraps from 6x6 paper pads and be a fun way to use up a lot of those 6" Strips as well as some of my button stash. I used Martha Stewart scallop dot border punch, scraps from MME, ivory card base and coral cardstock, ribbon and buttons from stash. I have about one hundred of the pearl buttons and colored some to match my card. Tip: I used one length of twine and looped all the buttons together which made it easy to arrange and attach to the card using Matte Accents. 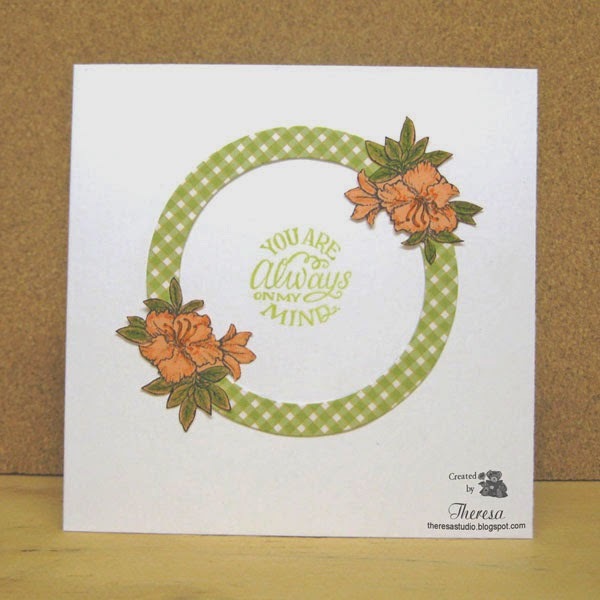 The sentiment is from Poppy Power Azaleas stamp set in Memento Peanut Brittle ink on a circle of ivory cardstock and matted on another scrap. Craft Catz Weekly: B is for.....used buttons and borders. Hello! I have been away from blogging for a few days but have been busy. I bought some new storage boxes at Joann's last week which led me to do some cleaning and reorganizing of some supplies. Then I realized I had so many partially finished cards .....had a lot of fronts without card bases and card kits that I never assembled or card projects that I had started and never finished. To clean up some clutter, I decided to spend some time finishing and assembling these projects and send the finished cards to Operation Write Home. I still have more to do. I ended up with 55 cards to send including a few that I pulled from my box of completed cards. I forgot to make a photo of the cards and now they are all in a box sealed and ready to mail. I am now trying to do some projects to make a dent in all the scraps that I have.....I never, never throw anything away. Also, I have been cleaning closets and switching winter items for the spring and summer clothes. Guess I am an organizing fool. Also have been cleaning the garden beds taking advantage of a few days of warmer temperatures and no rain. Shown below are the first of the daffodils blooming on 4-14-14. 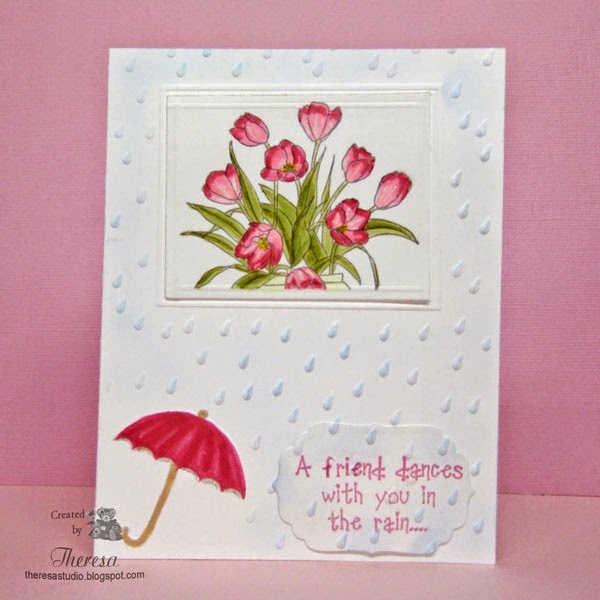 This is for a challenge April Showers at Charisma Cardz Challenge which is about to end. I embossed a white card stock and sponged the raindrops with Memento Summer Sky ink and colored in the umbrella with Copics. The April flowers are a stamp from Repeat Impressions colored in Copics RV23,29. Y000,YG 03,95. 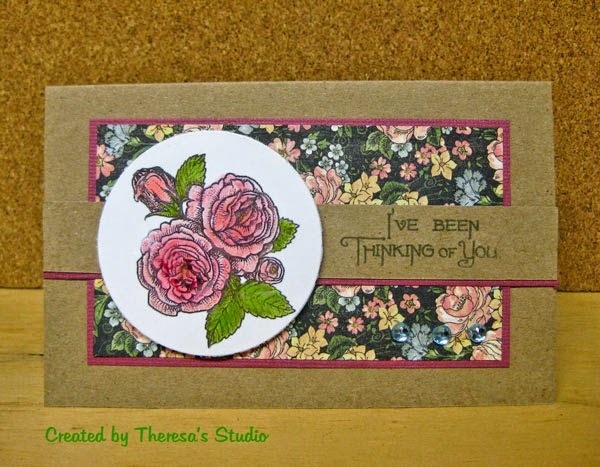 The sentiment is from Creative Clear Stamps and stamped in Memento Rose Bud. The EF is from Darice. Happy Friday! For this card I have used some embellishments by Jolee's that I have had in my stash for years...one of those items that I just had to buy but had no plan how to use when I purchased. 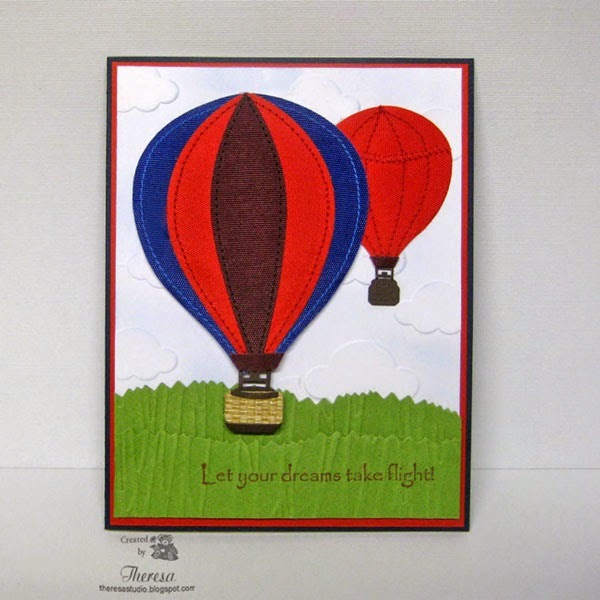 I decided it was time to use these fabric embellies when I read the challenge at City Crafter Challenge blog to make a card using a hot air balloon for their theme Up, Up and Away. I simply used a dark navy card base layered with a mat of red. I embossed a white card stock with Darice Cloud EF and sponged with Memento Summer Sky ink, added some green cardstock cut with fancy scissors and embossed with Cuttlebug Forest Branches EF, and attached the 2 hot air balloons popping out the bigger one. Finished with GKD sentiment stamped with Memento Rhubarb Stalk ink. Now to find a person and a reason to send the card. Hello! I am back again with some more Cameo projects. This time I have made a small basket for candy with an Easter chick. This was made with Silhouette files with papers from stash. I improvised how the basket was assembled by folding up the scallop edge of the base and taping to the side. 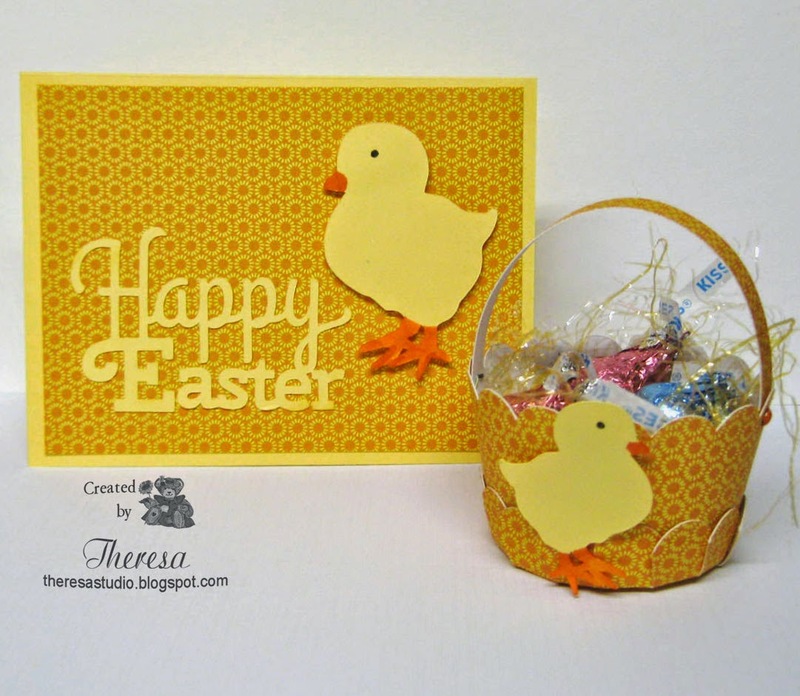 Since I had some scraps left, I created a quick card cutting the sentiment and a larger version of the chick and attached to the pattern paper and then to a card base of yellow cardstock. I gave some interest to the silhouette of a chick by coloring the beak and feet with orange Copic. Simon Says: Happy Easter and/or Sweet treats. Craft Your Passion Challenge: Make a project featuring bunnies, chicks or eggs. We have a light snow this morning and the temps are back in the 30's. Whatever is Mother Nature thinking? Easter is almost here. I have been playing with my Cameo making some baskets for sweet treats. I am also trying to use up some old papers. 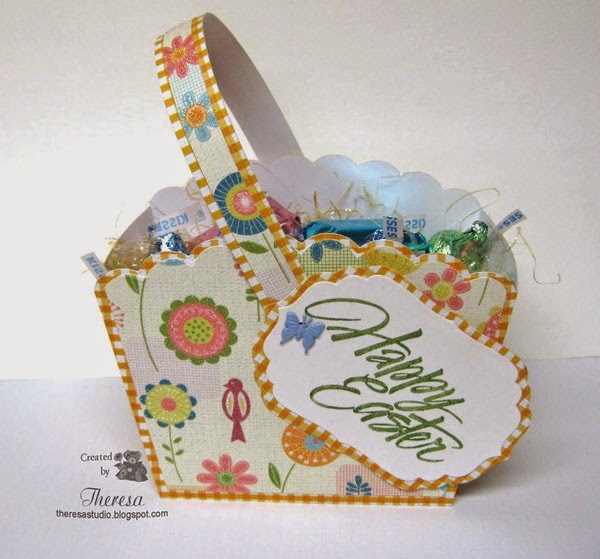 I cut and assembled this basket from some papers in the DCWV Flower Shower Spring Stack using a Silhouette design. I added the label cut with Spellbinder dies and stamped with a Hero Arts stamp in Memento Bamboo Leaves. Used some old butterfly brads to attach the handle and label. Filled with grass and sweet candy treats. Welcome! I am looking forward to the blooming of Azaleas but I was able to capture this lovely flowering plant on a card with a stamp designed by Marcella Hawley for her new company Power Poppy. I stamped with Memento Espresso Truffle ink on white CS ....this gives a much softer look than stamping with black ink. I colored the image with Copics E 25,35, YG 000,63,93, and YR 000,00,02 and cut with Spellbinder Die Label 4. All the pattern papers that I used are from Webster Pages Park Drive pad that was from Joan's Gardens. I used strips of gold under the image and green as the border for the image layered on the check which has all the colors that I used. Finished with a sentiment from MFP's stamped in Memento Olive Green ink. Joan's Touch: Challenge is to use plaid, check, or striped paper, a border around an image, any colors, and a product sold at Joan's Gardens. Pattern papers are from Joan's . Craftyhazelnut's Patterned Papers: Challenge is anything goes as long as patterned papers cover entire card. I hope to work in my gardens again today.....temperatures to be in the 70's. For this card I chose the 7 Gypsies pattern paper for the background and then used it for the inspiration to color the image of Tulip Bouquet by Repeat impressions. I stamped the flowers on ivory CS with Memento Tuxedo Black and colored with Copics R00,20,22, B000,01, Y21, YG91,93,95. I assembled my card following Repeat Impressions sketch #A214 using green CS for the card base and mats adding ribbons, bow, and pearl buttons with yellow twine. Since I ended up hiding so much of the lovely designs in the pattern I cut 2 of the floral bouquets from the paper with a circle Nesties die and added with the sentiment. Love and Hugs was a portion of a Repeat Impressions sentiment that I stamped with Memento Olive Green ink and cut with an oval die. 613 Avenue Create: Challenge is anything goes with the option of sights, sounds, smell, taste of spring. My card has some of the sights of spring. Really Reasonable Ribbon Challenge: The theme for Challenge #92 is Flowers or Buttons & Bows. Welcome! This card was the result of playing with some colorful papers from Webster Pages Park Drive pad and some Cheery Lynn Dies. 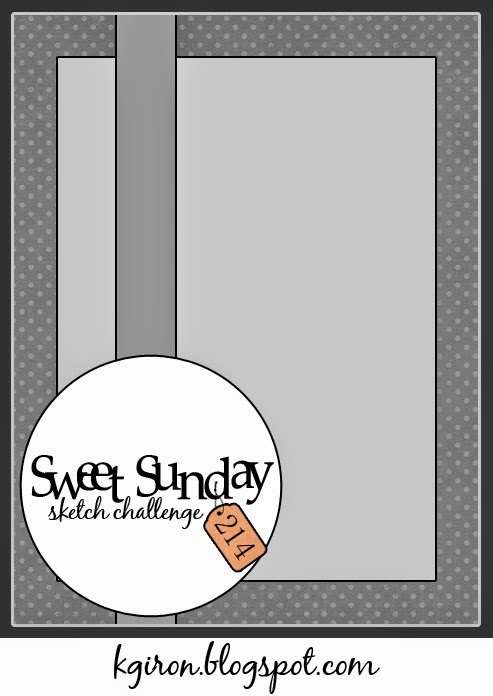 I was trying to design an entry for the challenge Anything Goes at Cheery Lynn Design Blog. I used Ivory CS as the base and Green Paper for accents cut with Ambergris Tiny Doily and Cathedral Lace Frame (used only a side panel from the frame). I am always experimenting with different uses of dies rather than the intended use. 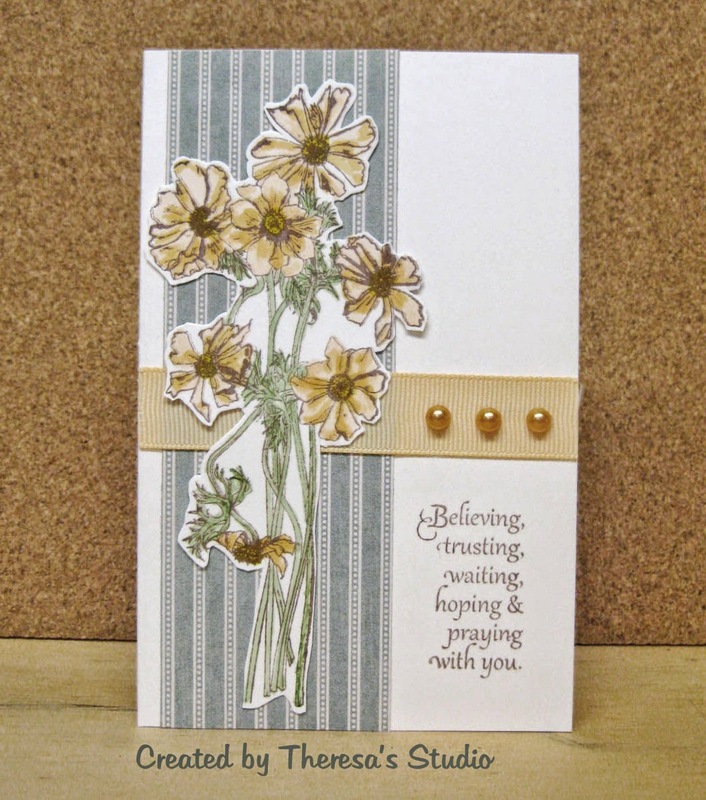 The other elements are all from Pattern Papers cut with Build A Flower #1 and Ambergris Die. I used Spellbinders dies for the circles. I used Memento Morocco ink for the MFP's stamp. I was using the sketch below for the layout. I do like the combo of colors and the pop of the spiky flower. Photo came out a bit dark so use your imagination. This card was made with some of my first GKD stamps which I still love to stamp. 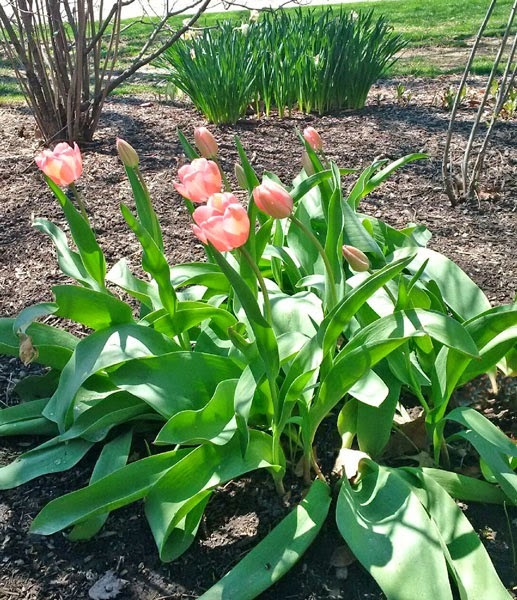 Spring always brings beautiful blooms and colors which I look forward to each time. I made this card to cover 5 challenges which are listed below. I used a GKD grass green card base and layered with my own created designer paper- white paper stamped with a GKD script stamp from Botanicals in Memento Bamboo Leaves ink. I partially stamped the iris stamp from Elegant Flowers in Versamark on 3 rectangles cut with Spellbinders die and heat embossed with Clear EP. I colored the images with bright color Memento Markers Lulu Lavender, Rose Bud, Cantaloupe, Dandelion, and Bamboo Leaves. I matted each on Grass Green mats and attached to the card. I finished with a sentiment of Easter Blessings from GKD Spring Florals on a cut oval of white CS matted on a scalloped oval of the green paper. I used the sketch shown above from Tuesday Morning Sketches but forgot to use this week's twist so I am not entering their challenge. 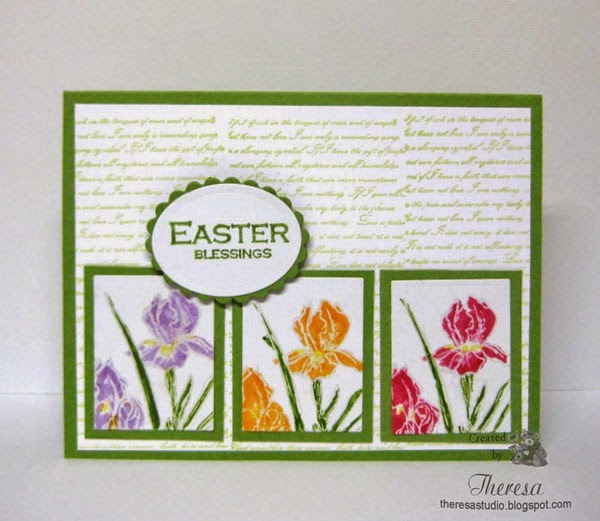 Mod Squad Challenge: Spring into Spring-create a spring themed card using at least 3 bright spring colors and your stamps to make your own designer paper. 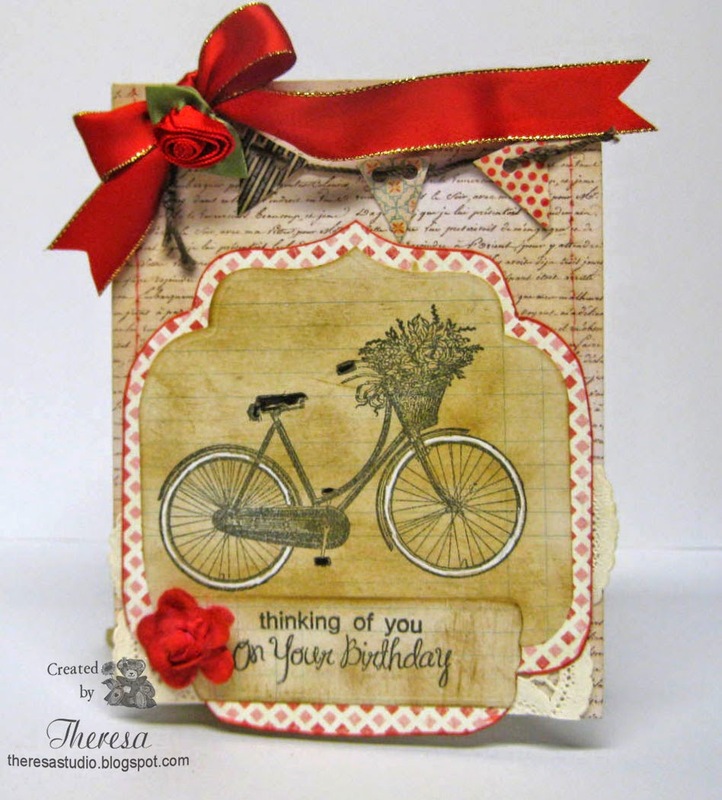 Stamp TV Mix It Up Monday: Create a project using one image stamped 3 times. Hello! Spring weather brings the urge to take road trips. The challenge at One-Layer Simplicity this month is Road Trip. I thought my stamp from Lili of the Valley of James driving his convertible would be perfect for my one layer card. This car reminds me of my DH's convertible so I colored it to look like his. I stamped on GKD white Cardstock with Memento Rich Cocoa and colored with Copics E0000,30,33,35,50 , Y26,28, N2,4,and 7. Also used Gray pencil, Metallic silver Jell-ink pen and Glossy Accents. Found the perfect sticker from Creative Imaginations to complete my card. A most often asked question on our trips is "Are we there yet?" 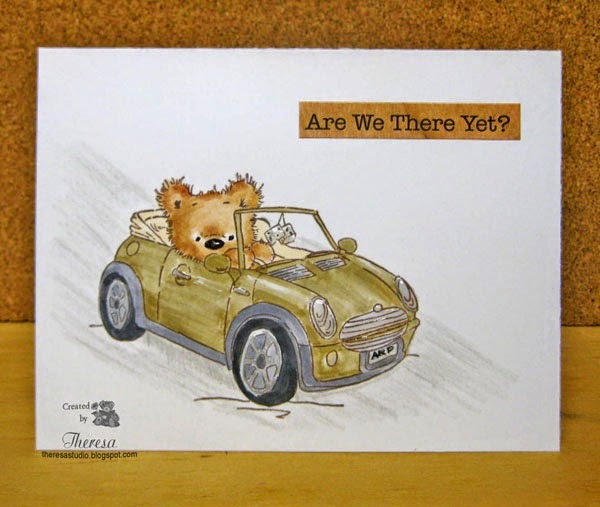 Fussy 'n' Fancy Friday Challenge: All About travel....card may not be very fancy but fits the theme. It's raining today ....not a good day for a ride in an open convertible. My plan today was to get an early start on some neglected housework but my urge to make a card won out. I am blaming that on the challenge at City Crafter blog who by the way are celebrating their 4th Birthday. 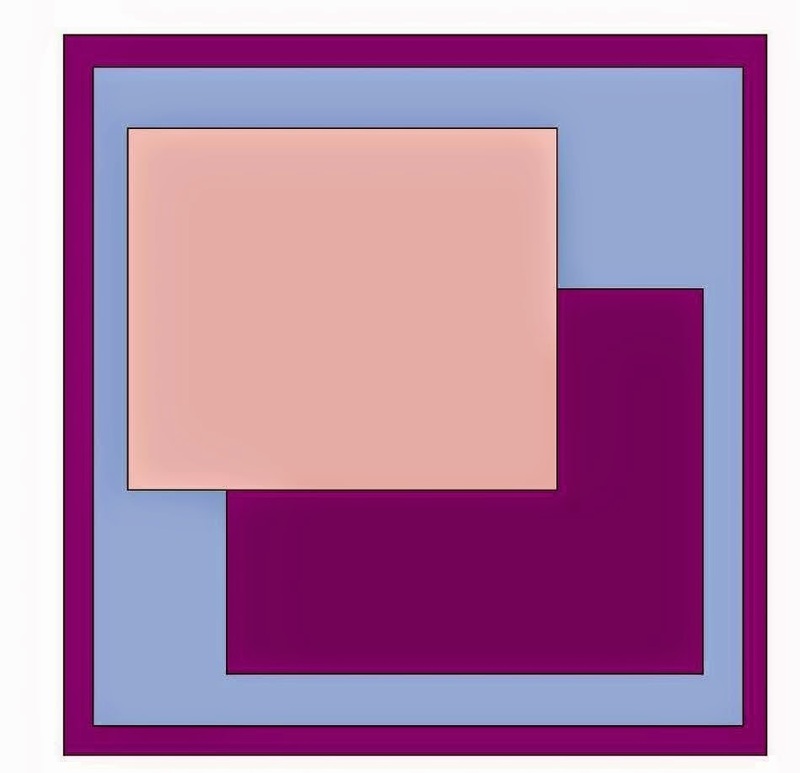 Their challenge is to CASE one of the cards shown on their blog today. I chose to CASE the card shown at left. I seldom Case cards because I am not sure how much to copy....it does mean Copy And Share Everything, doesn't it? 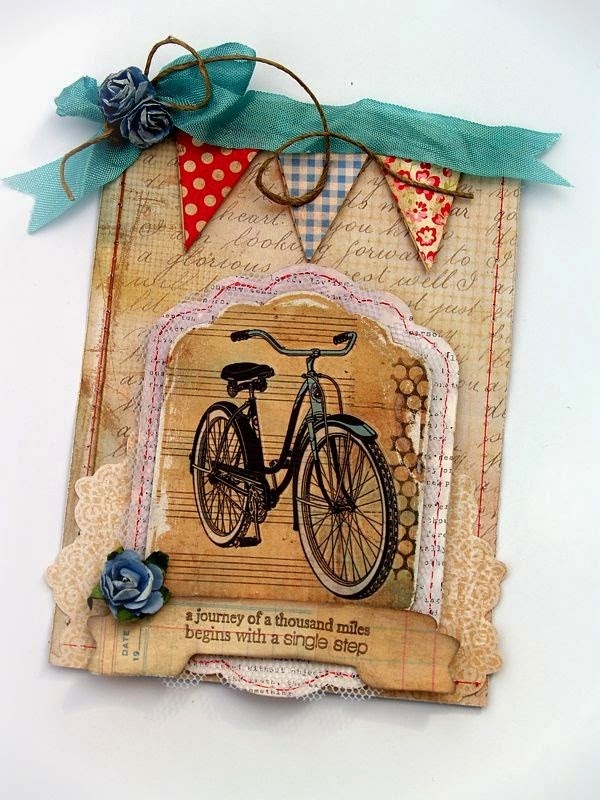 I may have gone too far because I used the layout, theme, ribbon, pennants, twine, flowers, stitching, and bicycle theme. I even tried to mimic the same pattern papers. You be the judge of if I over did the CASEing. But anyway I like the way the card turned out. City Crafter Challenge Blog: CASE one of 4 projects. I did project 2 . Simon Says: Make a Happy Birthday Creation. Clear It Out Challenge: Anything Goes with a twist of faux or real stitching. Now that my card is done and posted, it's time to get out the cleaning tools and supplies. Welcome! As you may know one of my favorite themes for cards is Bears since I am a Bear Collector. I have had this digital image from Beccy's Place in my files for a number of years. I decided he would be great for the challenge at Digi Sketch which is to use Bears. After printing, I colored him with Copics E 0000,25,35,50,R43,46,Y28 and fussy cut the image. I used the sketch shown to the left but gave it a turn before assembling the elements. The card base is GKD Brown CS matted with Kraft Paper from stash which was embossed with Darice Chevron EF. I added a rectangle of pattern paper from Crate Paper DIY Shop Collection and then the Bear who has a lot of heart and love. Finished with a die cut label from the Crate Paper collection. Digi Sketch Challenge: Theme is bears. Sketch above is optional. Beccy's Place April Challenge: Create a card or project using any Beccy's Place digital image. Wishing you a day full of love. Have you hugged a teddy bear lately? I was playing with some vellum paper and my Cameo machine and decided to cut a feather design in vellum. This design reminded me of a quill pen, a writing implement made from a feather of a large bird. I decided using the feather on a note card would make an interesting design. I started with a card base of a glossy Oyster Pearl cardstock and layered it with a mat of Graphics 45 Pattern Paper in brown and ivory. 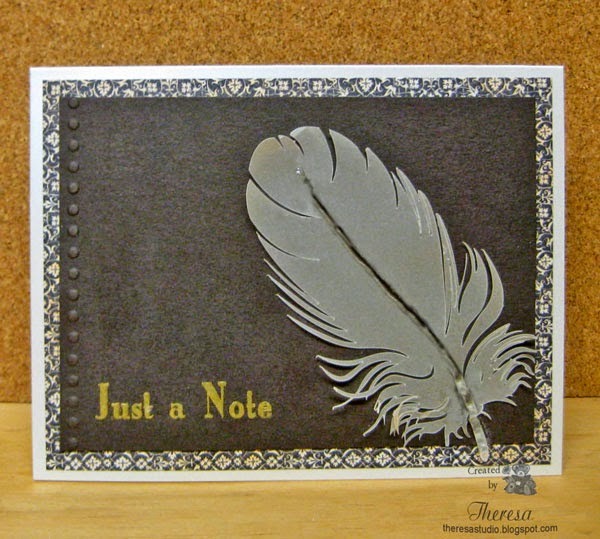 I did a row of dry embossing on a piece of GKD Brown CS and heat embossed a sentiment from Mark's Finest Paper stamp "Just a Note" using Ranger Embossing Pearl Gold powder. I attached the Vellum feather using glossy accents on the center of the feather creating a dimensional quill which also served the purpose of neatly gluing the feather. Since it is hard to attach vellum elements without the glue or tape showing through, this was a good way to conceal the glue. I think this is a great masculine card with a Victorian look. Speedy Fox and Friends Challenge #206: Theme is Use Vellum. It's been awhile since I entered a card here. This card was just right for this week. Welcome! This is a second post for today. I love stamping and coloring but I also like to use pre-colored digital images, especially the ones created by Doodle Pantry. 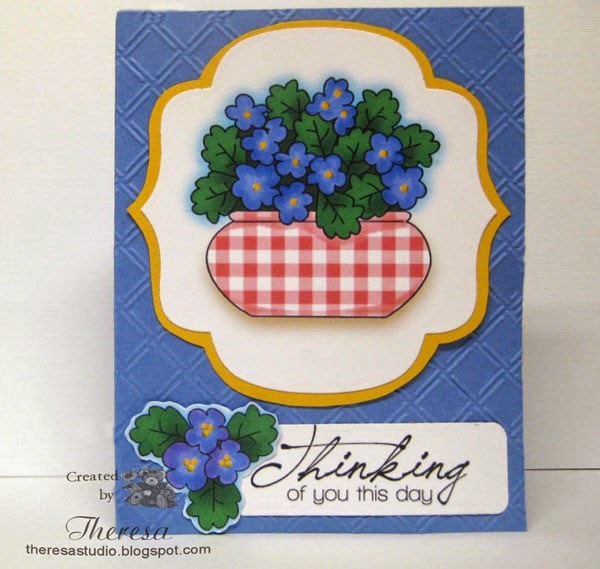 From their files, I printed 2 colored images from Spring Violets and the sentiment from Poppies and assembled this card on a bright blue card stock from my stash that I embossed with Cuttlebug EF Windowpane. The large image was cut with a spellbinder die and matted on yellow cardstock that I cut using the die as a template . I used a yellow glaze pen on the centers of flowers to highlight. Cannot wait until I have violets blooming in my garden. This card was made for a couple challenges. I followed the layout from Tuesday Morning Sketches. I used pattern papers from MME's pad A Mother's Love for my color inspiration and layers. 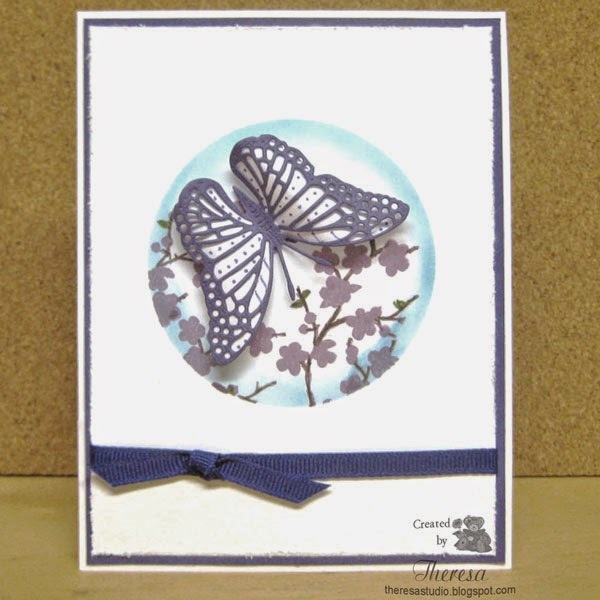 I began with a card base of Blue CS from stash and layered with an embossed mat of Floral Pattern and placed on that an oval of the blue cardstock layered with an oval of Polka Dot pattern. The blue oval was cut with Cheery Lynn Swedish Spring Oval Frame die but I trimmed off the outer edge to make it fit the card size. I stamped the Hero Arts sentiment with Memento Morocco Ink. I cut the butterfly from Coral and Orange CS with Cheery Lynn Small #2 Exotic Butterfly die and Small #2 Angel Wings. This was attached with pop up dots. 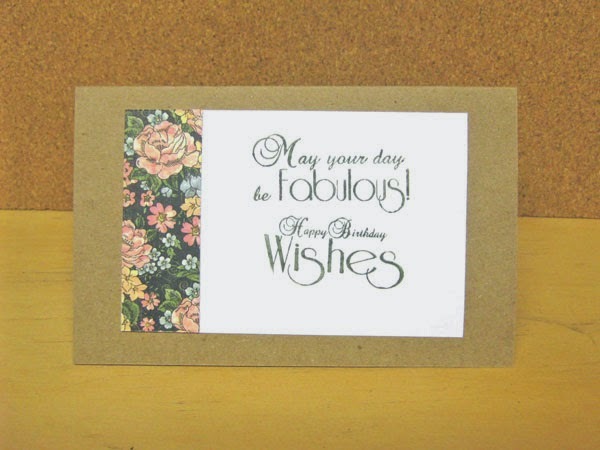 I finished with the green Flourish cut with Cheery Lynn Fanciful Flourish Die. One last thing: What do you do with all the small leftover pieces when you die cut a detail pattern? When I cut the Oval Frame I had all sorts of pieces including tiny blue flowers which I added to the centers of the flowers on the pattern paper to give a bit of dimension. Not a one was wasted. Welcome! 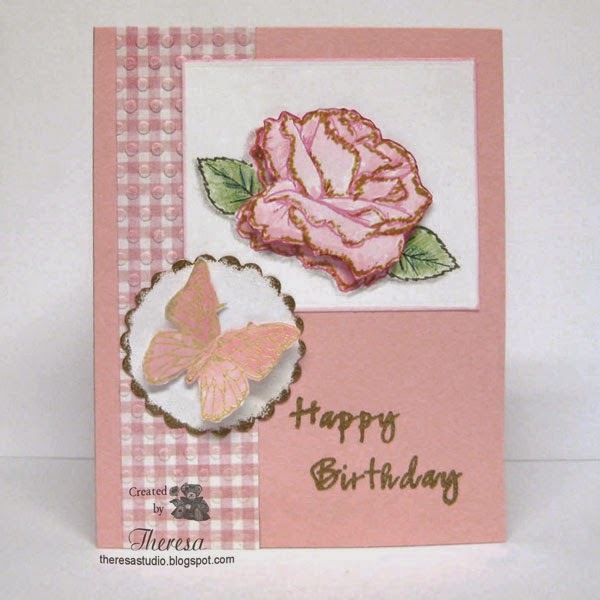 Today I have been playing with a never used by me stamp set from Flourishes Wild Roses, one of their last releases. I stamped the image with Memento Rich Cocoa on GKD White Card stock and colored with Copics R00,R11,R22, Y12, YR00, YG 93, YG95. After trimming the edges I distressed with a distress tool and sponged with Distress Ink Antique Linen. I matted this on a layer of Pattern Paper from Graphics 45 Once Upon a Springtime. I only have a couple sheets left from this collection. I used the same white Cardstock for the card base. I cut a small doily with Cheery Lynn Ambergris die from another Graphics 45 paper and cut it into 4 sections that I used for the corners of my card. I finished with a pink ribbon bow and yellow glitter domes in the center of the flowers. 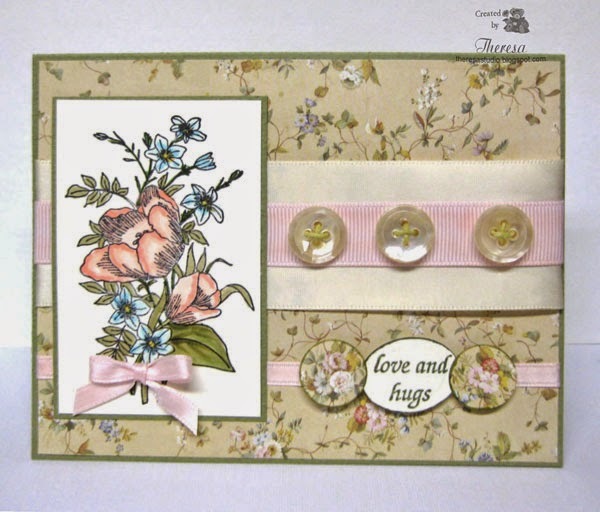 Joan's Touch: Challenge 7- Use pattern paper, a stamp and add some corners. Use a product from Joan's Gardens. The Graphics 45 pattern paper was from Joan's. Newer Graphics 45 patterns are available as well as the Cheery Lynn Die. 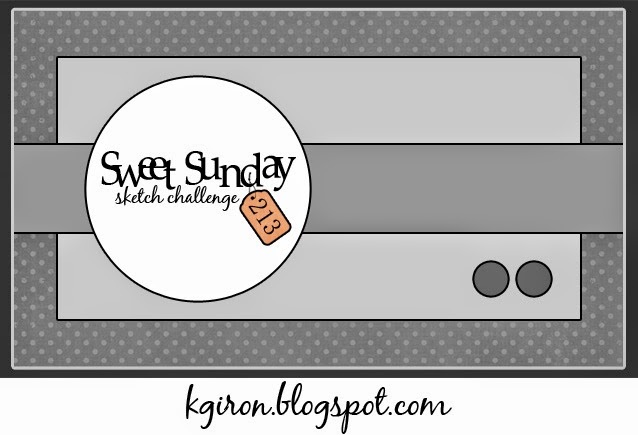 This card was inspired by the sketch from Sweet Sunday shown below and by last week's color challenge from The Kraft Journal. I missed the color challenge deadline but adapted the card for their challenge this week by showing the inside of the card. I began with a card base of Kraft cardstock and added a center panel of floral pattern paper from Graphics 45 layered on a mat of dark rose cardstock. The Kraft strip was stamped with a MFP's sentiment in SU Always Artichoke ink and added with an edge of the dark rose cs. My rose image was stamped with Flourishes stamp from a Year of Flowers set and colored with Copics. This was cut with a Nesties Circle Die and attached with pop up dots. I added 3 blue rhinestones to pick up the blue color in the pattern. The size of this card is 3.5 x 5.5". Inside uses more MFP's stamps and Memento ink. I seldom make anything but a card sized 4.25 x 5.5" but this is a skinny card measuring 3.5 x5.5" that I made for a change. The stamps are from Flourishes Anemone set. The flower was stamped with Memento Rich Cocoa ink on ivory cardstock and fussy cut. ( I have the cut file for this but forgot to use). I colored with Copics G 82, YR000,00,20, Y06,32. I used a strip of Graphics 45 pattern from scraps and grosgrain ribbon from stash. Verse was stamped on the ivory card base in the same brown ink. After assembling card, I added 3 pearls for a bit of bling. 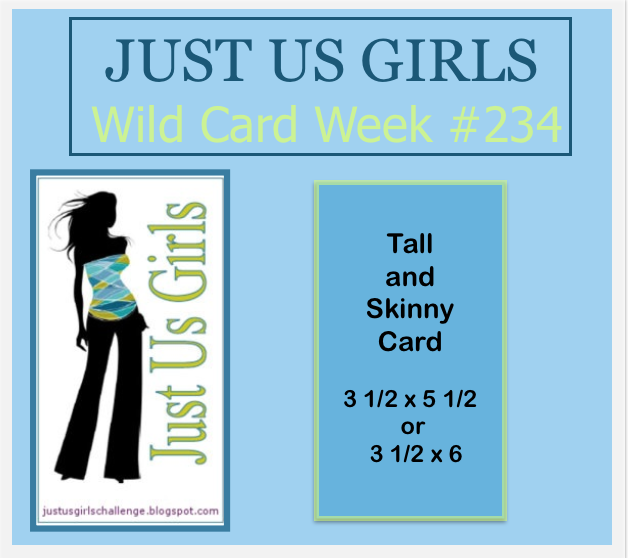 Just Us Girls: Wild card challenge-make a tall and skinny card. Never too early to start on Christmas cards. For this one, I used some new to me pattern papers from Pebbles' Welcome Christmas pad. I started with base card of stripe pattern layered with Merry Christmas text pattern...no need for a sentiment with this paper? 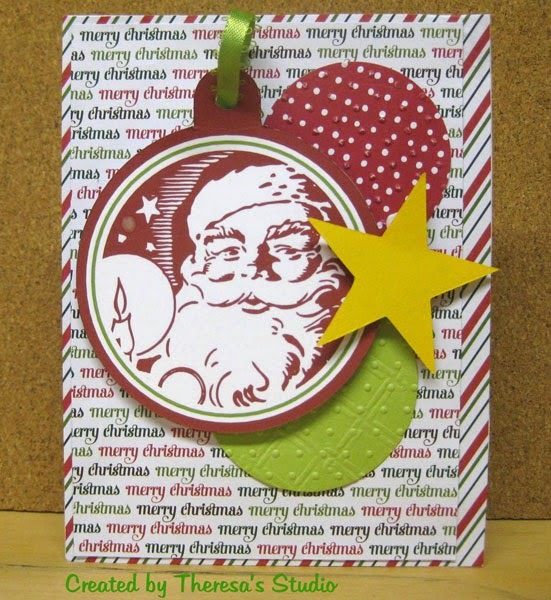 Added 2 dry embossed circles cut with Nesties dies and an ornament with Santa, a Print and Cut File made with my Cameo. Finished with a bit of green ribbon and a yellow star cut with Sizzix die. I used last week's sketch from Paper Players but missed their challenge deadline.